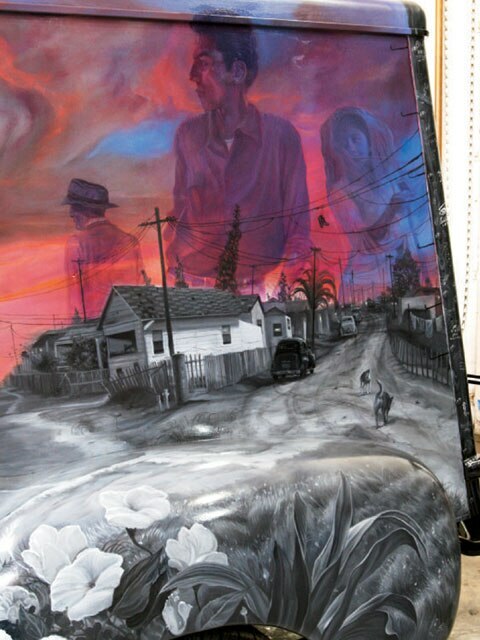 Legendary Guitarist Ry Cooder pays Homage to a Lost Neighborhood. April 1, 2008 by Saul Vargas, Edgar Hoillc, Jessica Lopez, Zack Felix and Desireable Ones C.C. A UFo hovers in the sky in an attempt to warn La Raza down below about the impending destruction of their barrio as a skeleton construction worker begins to bulldoze their homes. this may sound like a scene straight out of a Robert Rodriguez sci-fi flick, but it’s not. It’s the image depicted on the cover of Ry Cooder’s 2005 album, Chavez Ravine. As its title suggests, the album is a musical tribute to the actual Latino community in Los angeles, California, that was demolished to make way for Dodger stadium. so it seems fitting that Cooder, a Duke’s Car Club member and lowrider aficionado, would continue to memorialize the long gone neighborhood, but this time using a ’53 Chevrolet ice cream truck as his canvas. That woman, further explains Cooder, was aurora arechiga. she was just one of the thousands of residents who were removed from their land during the “battle of Chavez Ravine.” throughout the early 1900s, Chavez Ravine was a tight-knit community populated by generations of immigrant and native Mexicans. but by 1949, the city of Los angeles labeled the area as an “eyesore” and identified it as a prime location for redevelopment. A year later, the residents of Chavez Ravine received letters from the city stating that they would have to leave their homes to make way for a more “attractive” housing. the city promised that they would have the first chance to move back to the new development once it was built, but instead the city sold the land to baseball owner Walter o’Malley, who eventually built Dodger stadium on the site. 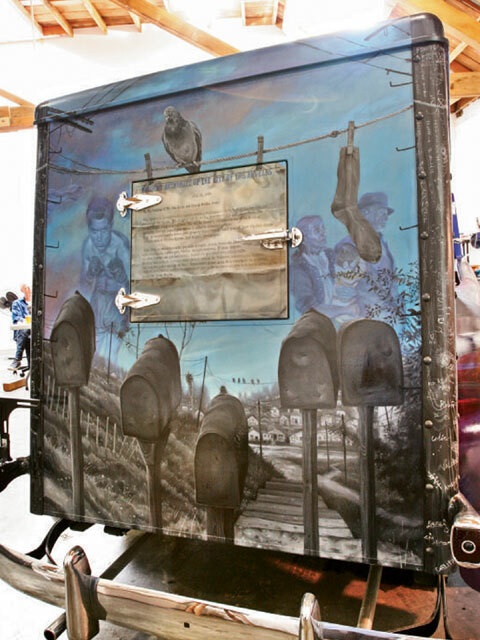 Appropriately dubbed “el Chavez Ravine,” the truck artistically expresses the socially complex story of Chavez Ravine and the many indignities suffered by the Latino community. 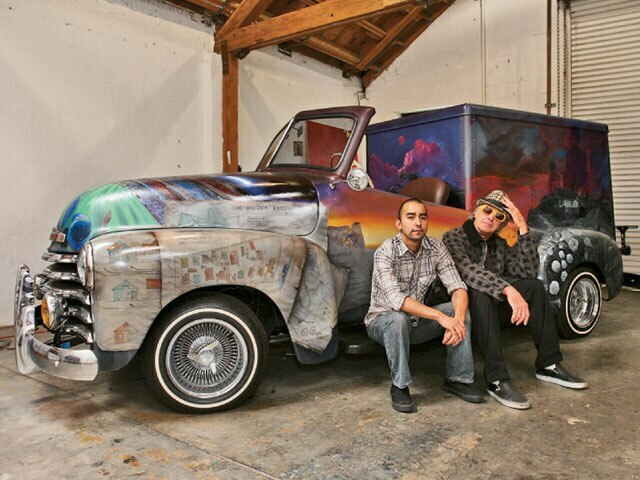 the chopped, dropped and mural-clad vehicle is currently housed at the petersen automotive Museum in Los angeles, where it made its debut at the opening of “La vida Lowrider: Cruising the City of angels.” Cooder says that having his truck in such a prestigious exhibit is an honor and no small feat, but then again neither was refurbishing the classic chunk of metal. LRM met up with legendary guitarist Cooder and legendary lowrider builder Ruelas to get the lowdown on the making of el Chavez Ravine. you can check out the vehicle at the petersen automotive Museum until June 8, 2008. LRM: Why have you been so fascinated with the history of Chavez Ravine?RC: Well, I was born and raised in the Los angeles area and I can remember my parents and their friends discussing ways in which the people who lived there were being evicted from Chavez Ravine and their land being handed over to developers. the land was supposed to be redeveloped to make way for affordable housing for its residents, but of course that never happened. I’ve always found it interesting how people in power talk about “progress.” to me, it’s just an amusing word to describe paving over things of beauty. the story of Chavez Ravine is basically the story of corruption and greed… what was going on in L.a. then and is still going on now. LRM: so you decided to transfer that history onto a lowrider?RC: Yeah, to me it was the perfect subject to mural on a lowrider. I felt that if the image was presented on a lowrider I could really preserve it, unlike on a building that could be vandalized or knocked down. I was just puzzled as to why no one had done it, so I just pursued it. 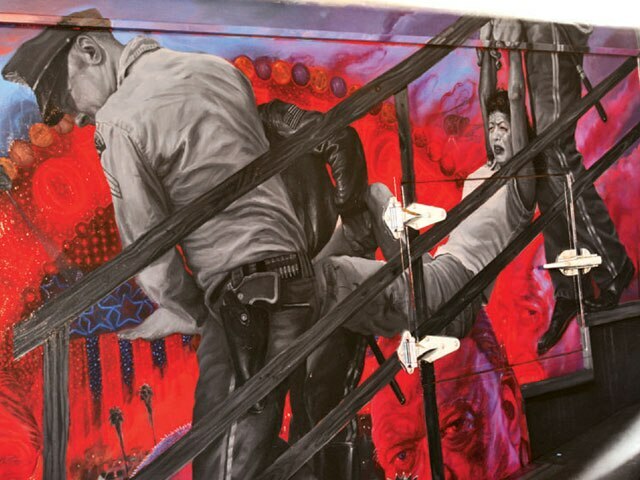 also, Chicano art and the lowriding culture just go together so it made sense to preserve it in this manner. I wanted people to be pulled into it in an emotional and fundamental way. LRM: Where did you find the truck? RC: Fernando had it in his shop. I couldn’t find one myself, these trucks are basically extinct. FR: the truck was owned by my son, who later gave it to my wife. I met Ry a few years back. He was looking to do a project vehicle because he had just cut the Chavez Ravine CD. but it actually took me about three months to decide if I wanted to do this project, but he kept calling and asking, “Did you find my truck?” I asked my wife if she wanted to get rid of hers because at the time I couldn’t find a truck in good enough shape to work on. My wife agreed to sell it and I finally told him that I found him a truck. LRM: How much money have you put into building the truck?RC: I can’t even tell you, but somewhere in the six figures. the truck cost me $1,500, but the rest was quite a heroic and expensive undertaking. I had to find someone to mural the car and that could only be done by vincent valdez; he’s the only human being who could do it. If he hadn’t have done it, I probably would have abandoned the project. LRM: How did you hook up with vincent?RC: It was hard because he was out in texas. I basically had to import the guy here and set him up in a studio in boyle Heights. It took him two years of his life, but vincent found a way to visualize this in a rather poetic manner. the mural isn’t linear like a series of photographs; it’s not a map, it’s an impressionistic thing. He did a fantastic job. I mean, he had to deal with the shape of the truck, which isn’t like painting on a flat surface or the side of a building. LRM: And the mural was all done by hand with oil paints?RC: That’s the thing to know about this truck. It was all done with oil paint and that’s why it took him two years. But that’s his technique. He’s not an acrylic spray gun guy. It was quite an undertaking people said it would never work, but we ignored them and pressed on. LRM: How was he able to recreate the images?RC: Well, he researched the pictures that were taken in 1949 by Don Normark, who spent a year photographing the neighborhood for a class project. I also took vincent up to the Dodger stadium and had him overlook the city so he could get a feel for it. and I gave him a bunch of historical material that I had collected over the years and he took it and studied it. LRM: Can you talk about some of the images on the truck?RC: There’s lots of stuff, ghost figures taken from photographs of people who were from Chavez Ravine. One of my favorite things is the image of a copy the original eviction notice, which was given to the families before they were thrown out. you can see that he positioned the notice in front of some mailboxes that seem to be reading it, like a family of people looking at it saying, “What are we going to do? What’s happening to us and our world?” He also populated it with key players of the time, like Walter o’Malley, J. edgar Hoover and Fritz burns, who was the evil nemesis of the whole thing. LRM: But before all the murals could be painted on the truck, it had to be restored. Can you talk a bit about the construction of the truck?FR: Well, we wanted to make this in the style of an ice cream truck, so we took an actual model of a Good Humor truck and worked from there. LRM: How long did it take you to rebuild the truck?FR: It took me about 12 months to do all the body work. the truck was in good shape, but it needed work. The engine was all there, but it needed to be worked on, the whole drive train and the wiring. the interior isn’t stock either. I got the seat off a sedan Delivery. I also did lots of other things like install fog lamps taken from a ’40 Chevy, installed dual pipes and Fenton headers. It just took a lot of restoration work. LRM: What was most challenging part?FR: Cutting the roof and fixing the doors. the doors are all welded and everything is molded in, the back fenders, the front fenders. I didn’t really see this as a challenge. this project was just another notch in the belt. but, it definitely couldn’t have been done without the support of my wife, Gloria, my sons, my nephew and “Chivo,” who did all of the transmission work. and, of course my fellow Duke’s Car Club members had a helping hand, too. They all did something. LRM: so where’s the car going next?RC: I don’t know. there’s a big art museum in san antonio, texas, that wants it for display for a while. that would be cool, but I certainly like it being here, part of the petersen Museum. It’s an honor for me to be in the show in the first place, among all these exceptionally dedicated and focused people who build lowriders. I dig it. Vegas Rider Laid To RestLowrider Pioneer Billy Ray Felix Contributed Much To The Las Vegas Scene.Billy Ray Felix was born and raised in Rancho Cucamonga, California, and was messing with lowriders since he was a teenager. In the ’70s, billy moved to Las vegas, Nevada, and he took the southern California car culture with him. billy built several cars through out the years while he lived in vegas. after supporting his son Marty, who was also lowriding, billy decided to help him out and make it a family thing by helping to start the Desireable ones Car Club in vegas. As an active member of Desireable ones, billy participated in car shows and other club events. He was a very humble person, whether he was at a show or just hanging out with his family. He made a lot of friends through lowriding. He was also a hard-working man who loved his job and his family. Nine years ago, billy was diagnosed with a liver disease and the doctors told him then that the condition was terminal, so he started living life to the fullest, concentrating on his family, his lowrider and his work. eventually, the disease caught up with billy and got so bad that he would spent the last months of his life in a hospital. Knowing that the end was near, billy’s sons contacted Danny D. of D&D Designs to lay out a candy paint job on a coffi n for billy. Danny took the job and called on a few friends to help out. One of his first calls was to abel Rocha, who put down some murals after Danny laid out the graphics. once the patterns and murals were done, efrain “bugs” Gonzales was called to help with some pinstriping and gold leafing. The last things to be done was to clear and rub out the casket. this task was taken on by Ruben “buggz” ochoa. buggz made sure to clear it, cut it and buff it so billy could go out in style. once the casket was done, billy’s sons Marty and zack went to Los angeles to pick up billy’s “last ride” from Danny. billy passed away the following day. Billy’s services had lowriders from the Desirable ones and a few cars from other vegas clubs that came through, like Uce, Royals and others. 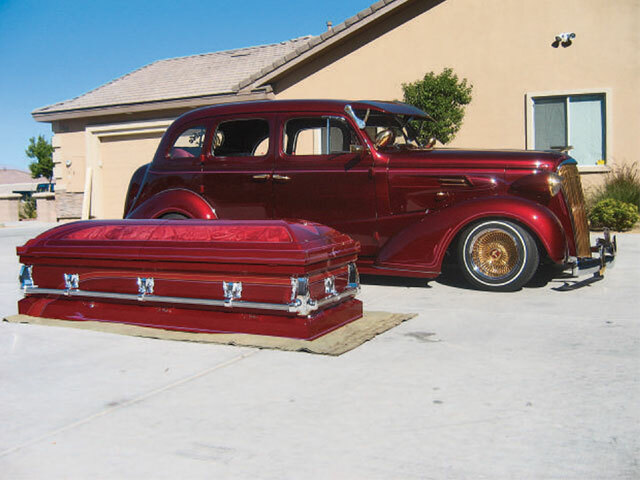 From his first car to his last candy brandywine ’37 Chevy Master Deluxe that was mimicked by the custom casket that was painted for him, billy always rode in style. billy Ray Felix is survived by his wife, sons, daughters, grandkids, and brothers and sisters. R.I.P.